For most homeowners, time spent outdoors during the warm summer months is priceless. Chester County deck builders are eager to help design and build outdoor living spaces that realize any homeowner’s dream. The days of neglected backyards and deteriorating patios are a thing of the past. With more emphasis placed on time spent with the family at home, traditional decks are now referred to as outdoor living spaces. With innovations in materials and more time spent on unique designs, the sky is the limit when considering a new deck. Many deck companies are now turning to innovative materials such as composite decking. These materials allow builders to test the limits when creating unique outdoor living spaces. Not only is there much more flexibility in regards to building more dynamic deck structures, but composite materials simply last longer and look much better. The is less time needed for maintenance, and more time available for entertaining. 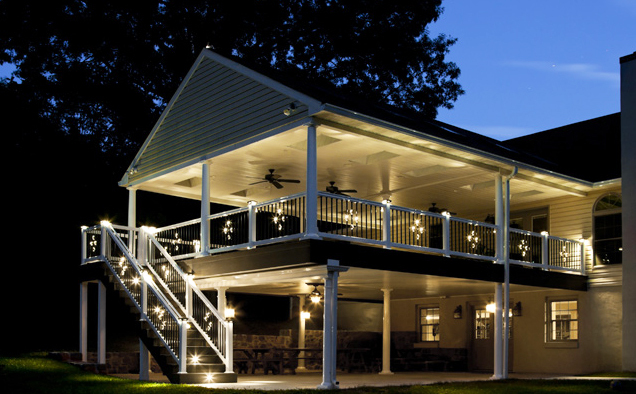 With larger decks that are designed for entertaining in mind, outdoor lighting is also an important factor when creating an outdoor living space. Exterior lighting is no longer an afterthought, but an important part of the overall design process. Innovations in solar technology, as well as more efficient low-level light sources, make entertaining after the sun goes down, more attractive than ever. With larger and more complex deck designs, deck builders are able to incorporate many additional features into a client’s new outdoor living space. Outdoor fireplaces, spas, and gourmet kitchens are not uncommon components in many new designs. Homeowners today have many options to consider when designing their new decks. These options allow people to bring their personalities outside the home and into the new outdoor living space. From unique lighting to an endless selection of deck accents, homeowners can be proud of their new living space, and can look forward to years of memories with both family and friends.